One of the more common causes of injury in the United States is the “slip and fall.” Catching individuals unaware as they are walking, slip and fall injuries occur when an individual trips, stumbles, or slips, and falls, sustaining an injury. In some cases, such as when hiking and tripping on an exposed root, the resultant fall is an unfortunate accident, but not an incident involving legal liability. However, in other situations, responsibility for the accident can be assigned to someone or some entity. In these cases, it is valuable to engage the services of a slip and fall attorney. Recently, Canadian tennis professional Eugenie Bouchard won her slip and fall action against the United States Tennis Association for an accident she suffered at the 2015 U.S. Open. While in the locker room, Bouchard slipped on a cleaning substance that was on the floor which not only caused her to suffer a concussion and withdraw from that tournament, but the cleaners gave her a burning sensation when they contacted her skin. A discussion of the legal basis for slip and falls, as well as both common situations that could lead to such accidents, and common injuries that can result, will follow below. Slip and fall accidents generally are litigated under the basis of negligence (in some cases, premises liability may be the legal theory on which an accident may be based, but this article will focus on negligent theories of liability). To succeed in a personal injury lawsuit for negligent conduct in slip and fall accidents, generally, the injured party must prove the defendant’s action or inaction was the primary cause for any injuries that resulted from the fall. It should be noted that injuries resulting from a slip and fall accident are not limited to those of a physical nature, but could also encompass financial, emotional, and mental issues that affect an individual as a result of the fall. As an example, a physical injury may require taking time off work, which, if one is paid hourly, will affect his/her financial situation. Damaged or poorly-maintained floors and walkways. 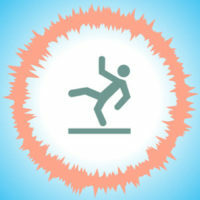 It is no surprise that floors and walkways are primary trouble spots for slip and fall accidents. They are not in the direct line of sight and, as a result, the risk that one will slip on debris or wet floors, or trip on damaged walkway, is very high. If you, or a loved one, sustained an injury due to a slip and fall accident, contact the attorneys at Pita Weber Del Prado as soon as possible. We have the experience to determine whether you or your loved one’s injuries is the result of negligence, and, if so, can get you the compensation you deserve. Contact our Miami office today for an initial consultation.